With a 3-year-old daughter running around the house, I’m constantly worrying about the germs she comes in contact with. She can go from playing with her toys that were sitting on the ground to visiting the bathroom and then heading to the kitchen where she just has to touch something she shouldn’t be (like the garbage can). Unfortunately for parents, children aren’t preprogrammed to stay away from germs! Good hand hygiene is something that needs to be taught at a young age. The earlier parents start teaching their child the importance of good hand hygiene the more conscious he/she will be to wash their hands after coming in contact with germs. Stressing good hand hygiene has to be done at all times – after playing outside, eating and after activities in the house that dirty hands. To promote good hand hygiene parents should make cleaning hands time fun, so their child will not only remember to clean their hands, but want to! 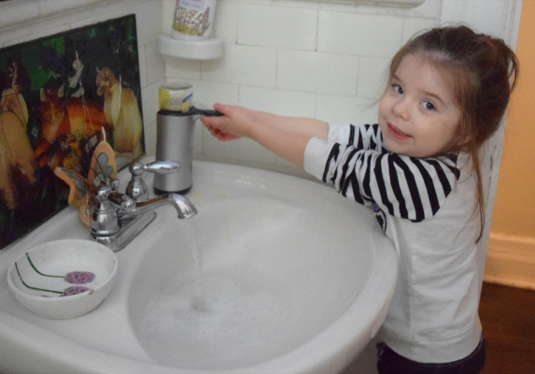 The Lysol® No-Touch™ Hand Soap System not only makes cleaning hands fun for kids, but helps them avoid coming into contact with more germs when in the bathroom. Pictured below you can see our old soap dish, which would end up swimming with germ infested water each day. Yuck! With the Lysol® No-Touch™ Hand Soap System, my daughter can simply place her hands under the sensor of the system and it automatically dispenses just the right amount of antibacterial, moisturizing soap. She avoids the icky germs from the soap dish and it has encouraged her to clean her hands more frequently! What more can a parent ask for? Additionally, the new and improved formula is perfect for the sensitive hands of young children. It contains a Moisturizing Collagen Complex, meaning that it’s both soft on skin and hard on germs. The Lysol® No-Touch™ Antibacterial Hand Soap refills come in a variety of fragrances: Aloe & Vitamin E, Cucumber & Watermelon, Cranberry, Cocoa & Brown Sugar, Lemon & Verbena. My family particularly likes the lemon scent. The Lysol® No-Touch™ Hand Soap System is also perfect for use in the kitchen. Making food becomes much more sanitary when you don’t have to grab the dish soap bottle to clean your dirty hands! This comes especially in handy when handling uncooked ground meat and chicken. Do you want to test out the Lysol® No-Touch™ Hand Soap System with your family? There is no better time than now because Lysol® is allowing consumers to test out the system for free with a mail in rebate (kit with gadget and refill, up to $14.99 value). Visit here to print the limited time coupon.